The crazy cupcake lady is back for one day only! I seriously had the best time making these cupcakes and I'm shocked! If you've been following me for a while, you may know that back in 2011 (omg what!?!?!) I set out to make a new-to-me cupcake once a month. And I did it! What I also did, though, was burn myself out. It's taken me 5 years to get excited about making cupcakes once again. Now I'm glad I caught the spirit just in time for St. Patrick's Day! Since I started a new job 6 months ago, I've actually been pretty vocal about having a food blog. I've never hidden it at my previous jobs, but in the first few days of employment, I was asked to name something interesting about me and I ended up citing this here blog. Since I already put it out into the universe (aka my entire office), I felt as if I sort of owed them a glimpse into my crazy food brain. Does that make sense? Probably not. It's the excess sugar that I've been inhaling from these cupcakes and leftover Valentine's Day candy. PInterest is a black-hole for creative people. I could get lost in there for days. 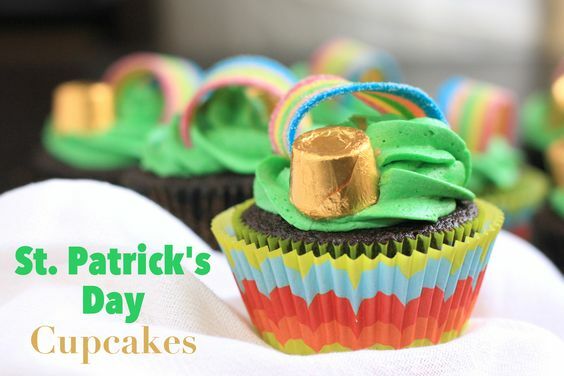 After viewing a few St. Patrick's Day cupcakes with similar designs, I decided that I'd go for some simplicity: rainbow, pot of gold (aka a Rolo candy) and of course a smattering of gold sprinkles (duh!). There are a lot more elaborate St. Patrick's Day designs out there but I wasn't trying to be in the kitchen ALL day long. I was also inspired to make this because Hoboken experienced yet another "successful" St. Patrick's Day celebration last Saturday. By success, I mean that everyone is drunk and useless by noon. So there's that. In honor of this, I busted out my tried-and-true boozy cupcake recipe and paired it with my favorite boozy frosting. Although I've made these recipes before I'll repost them here along with instructions as to how I decorated these cupcakes. May you have the most amazing St. Patrick's Day ever! The crazy cupcake lady is back! Can we take a minute to recognize that I haven't posted a cupcake recipe on this blog since May 2012. Now that's really crazy, considering how obsessed I was with them for such a long time. Today, I am fixing this situation. I'm coming in hot for St. Patrick's Day with some boozy cupcakes! St. Patrick's Day used to be my favorite holiday to celebrate. While it no longer is (because let's be real, I can't drink all day like I used to!) I still enjoy celebrating in spirit. If you happen to live in Hoboken, NJ, as I do, we tend to celebrate this day twice each March: once on the first Saturday of March, and once again on March 15th. I typically like to make something involving beer around this date and this year will be no exception. Boozy cupcakes are always in style. I know I'm a little late on this post. Memorial Day BBQ's are prime places to debut such delicious treats as Belgian White Beer Cupcakes. But that's OK. Why don't we think of this post as a great treat that you can use to ease into the rest of summer. When your friends least expect it, you can show up at a BBQ, bearing gifts of the beer and cupcake kind. You can say "Oh, these little things? I just felt like whipping these up for today. No big deal." I had a lot of success a few years ago with my Blue Moon Cupcakes, so I decided to make a variation of that. I really wanted to make these with Sam Adams' Summer Ale, but alas, I couldn't find any in my local stores. I opted to improvise instead of continuing the search, and I ended up using a Shocktop Belgian White Beer. Delicious stuff! So here's me raising my beer (cupcake) to you. Enjoy! It's November. It's Thanksgiving-time. This means that I have been slurping on Dunkin Donuts' pumpkin spice coffee approximately 3-4 times per week since the end of September. I'm not sure exactly why it took me forever to put two-and-two together and realize that the flavors of one of my favorite beverages should be recreated in cupcake form. I'm only slightly disappointed in myself. When my neighbor informed me that he was once again holding his epic pre-Thanksgiving Deep Fried Turkey party, I knew exactly where I could debut these cupcakes. Yep, right amongst the deep-fried turkey, deep-fried ravioli, deep-fried risotto balls, deep-fried onion rings...Do you see where this is going? This would be an excellent chaser for all that excellent fried food. I've had really poor "cupcake mojo" lately. As in really, really poor mojo. To give you a synopsis, these cupcakes were the result of 3 weekends of baking attempts. I even made two batches of cupcakes last weekend, but nothing was working. My cupcakes ended up either overflowing from the liners or deflating in the oven. Then there was that one time I accidentally added an extra cup of sugar to the batter, but we won't talk about that. Finally, after weeks of sucking at making cupcakes, I managed to pull out a dozen successful baked goods. Each month, I typically obsess for a few days about what kind of cupcakes I'm going to make. This month was no different. First, I thought amaretto cupcakes. Then I realized that I don't drink amaretto. And there's already too much odd liquor around this apartment without me adding more. Next, my roommate and I brainstormed some Independence Day themes. And I promptly realized that I had already executed our top two picks: some sort of apple-flavored cupcakes or berry cupcakes. Determined not to give up, we next thought that I could make a fruity daiquiri cupcake (think strawberry daiquiri). I confess that I don't really like fresh fruit. I think the fruit knows this because each time I try to incorporate it into a cupcake, things don't turn out exactly as planned. You know how some people have a "black thumb" instead of a "green thumb" when it comes to gardening? Well, I have a "black thumb" when it comes to fruity cupcakes. I can't seem to make them both look AND taste great. If I'm lucky, I'll get them to look OR taste great. But that's as far as I've gotten. So after a few more days of thought, I nixed the daiquiri cupcake idea. 2. Stef from Cupcake Project posted these Bellini Cupcakes. The signs were overwhelming! I knew I had to whip up a batch of champagne cupcakes. I realize that I've been lax in making cupcakes lately. What started out as the heart and soul of this blog has been passed over recently in favor of other dessert recipes and savory dishes. I also realize that Cinco de Mayo is right around the corner. Granted, it's not an actual celebration of Mexico's Independence Day (that's September 16th), but it's still a celebration of Mexican heritage. And when I think of Mexico, I think of tequila. There are other things I can think of as well, mostly having to do with food, but tequila is obviously the most important. I dug around in my Cupcake Bookmarks folder (yes, I have one) and found a cupcake I've been meaning to make for at least a year now: a Margarita Cupcake. I first heard of this cupcake when I was perusing the Cupcake Project website. Unfortunately, the cupcakes were vegan and I'm so not vegan, it's not even funny. No offense to my vegan peeps. I just enjoy eggs and butter as often as possible. So I looked around on the internet and to my not-so-great surprise, I found several other margarita cupcake recipes. I ended up combining the frosting from one cupcake recipe with the cake of another cupcake recipe and I think I ended up with some pretty respectable alcoholic cupcakes on my hands. You know how I made those Mocha Cupcakes before? And they weren't very mocha-y? Well, perhaps it's because I used instant coffee instead of instant espresso. I tend to do things like this a lot. It happens. But I finally found instant espresso in the grocery store and I needed to put it to good use. Hoboken St. Patrick's Day usually takes place on the first Saturday of March. Since my roommate and I were having a brunch party, I decided to remake the mocha cupcakes for this event. I decided I'd use espresso this time to increase the caffeine kick. And no cup of coffee is complete on St. Patrick's Day without a little Bailey's to top it off. Hello, new cupcake idea!